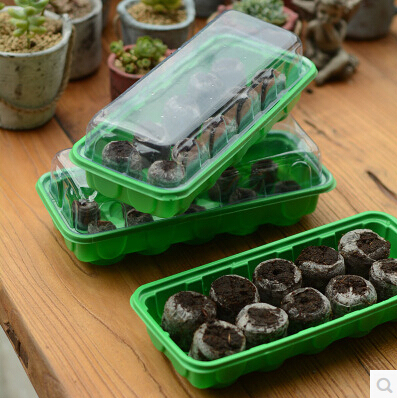 A nursery tray is a perfect way to start off your marijuana seedlings before they become adult. drain into the 38 mm mounted nursery block and add about half the water in the box. Dry nursery block will float in the water as the level rises. After a few minutes, the blocks will obsorb enough water and sink down to the nest box hole. After about 7-8 minutes, the peat block absorbs enough water and will start it’s expansion into small clods. The figure below shows the effect of the block with 38MM nursery. Adding your marijuana seeds into the block should be gentle and kind. Dont push them to far down either. 3 mm should be a good depth. After planting the marijuana seeds, lightly spray the blocks with water until they reach a damp texture. Too uch moisture and the seeds will not properly germinate, not enough and the seeds will not be able to enter into the germination stage. Close the lid and place in a dark, room temperature area. Cupboards, drawers or closets all work well for this. Once your seeds begin to sprout you can start putting them into their first pots under some red/blue spectrum mixed light.